Falloff controls for spotlights in DS4.5P? The "shader lights" in studio (Look in Lights/DS Default) have fall off. Word of warning though, they are going to over ride any lights already in the scene unless you hold down the ctrl (in windows) button and select add in the dialog box. They are also going to be different looking in the scene. The render beautifully though. It is late and my mind has started turning to mush..your also going to need to check and see if shadows work. I can't remember if they do or not and if they do it is only raytraced. You could set up your own lights in shader mixer with the proper shadows but you will need to do a search around the forum to find the instructions. Those lights are script samples that were part of the Script Dev kit in DS3, which is now included in DS4 so everyone has access to them, unless they have altered them since earlier builds then these lights don't cast shadows, you will need to edit their main file which is stored beside the main program files to get them to cast shadows. Spread Angle in the standard spotlight does what you want. However it only affects light fuzziness. To affect shadow fuzziness you need to dial Shadow Softness as well. It's true that it links angle and general softness appearance, so it can be tricky to use. Fall-off on a spotlight is an indirect way of affecting fuzziness, and is a good work-around. The UberSpot product by Omnifreaker has falloff and image map support. I highly recommend both those and the UberPoint product. They definitely cast shadows, and have a number of shadow controls that the default lights don't (including shadow color, shadow opacity, samples, etc.). I have issues with OmniFreaker's stuff and try to avoid using them any more than I have to. The documentation is nearly non-existent; what there is of it tends to be fairly arcane and difficult to decipher; and OmniFreaker himself is somewhat difficult to get a concise answer out of. Also, what seems to work in one version of DS seems not to work in another version. The only thing these script lights seem to lack (that I can see anyway) is that they can't be mapped, which is a real shame. If you set "cone outside" and "cone inside" to the same value, you get a perfectly defined circle of light, with a razor-sharp edge. Setting "cone inside" to anything less than "cone outside" gets you a degree of decay. There is also a slider labeled "decay" (with a default of 0 and a max of 2), which I so far haven't had much luck figuring out how to use. Setting it 1 or 2 appears to give me a totally black scene, so I'm gonna have to play around with this some more. I thought it was the exponent for the light falloff, but that doesn't explain the results I'm getting from it. Select "dzSpotLight".  For a quick test, I create a plane primitive, x-rotate the light -90 degrees and y-translate it up about 300, and you should see a nice cone coming from the light with a pool of light on the plane below. Assuming you haven't changed anything yourself and that DS is configured properly, the settings under the "Display" heading for the light should show be set for Edge Opacity, Ray Opacity, etc. Or maybe I'm misunderstanding what you're saying. These aren't volumetric lights, so you're not going to see an actual cone of light in the render (and if there IS a setting for that, I haven't found it yet). nor am I seeing any sliders at all... All I have is a shader spotlight that doesn't seem to want to produce light, even though I have it set at 200% intensity. There are no sliders at all for falloff, spread angle or anything. The only light controls are shadows and intensity. Under Display all I have are: visible in render, render priority, visible, selectable. Did something change or what? I've never actually tried these lights before. Yeah, I'm also using DS 4.5.1.56 (Win7 64-bit). I kinda hate to suggest it, 'cause you may have to redo any changes or customizations you've made, but you might try resetting your defaults to factory (Edit >> Preferences >> Interface >> Restore Factory Defaults), and see if that gets you back your light controls, or hit F3 to bring up the "Customize DAZ Studio" dialog, and see if you can find something in there that might be affecting your lights. Only thing that differs for the spots are the cone controls. Not a problem for me. Unfortunately, nothing happened. Decay is the rate at which the light dims with distance, as a power. 0 means it doesn't dim, 1 means it dims in proportion to distance from the light (usually used with the begin and end settings - the distance in cm from the light at which the brightness starts to drop and the distance at which it hits black), 2 is the physical inverse-square law fall off, with the light getting four times as dim at twice the distance from the light (like the DAZ default point-light). Using 2 will often give a dark scene, especially if the gamma setting is 1, but 1 shouldn't unless the end distance is smaller than the distance to the items in the scene. So the Decay setting IS the exponent for the falloff, after all, with 1 being linear (inverse) and 2 quadratic (square inverse). Still, changing ONLY the Decay setting on the dzSpotLight, a setting of .5 with Intensity set to 100% gives me a very dim render, and anything with Decay set higher is essentially black (evidently, the light has completely decayed before it can illuminate anything). Even with Decay set to 1, and with Intensity set to a ridiculously high 2000%, still renders as dim as with Decay set to .5 and intensity set to 100%. Is there a way to convert these lights over to lumens or candlepower or watts or something more real-world? 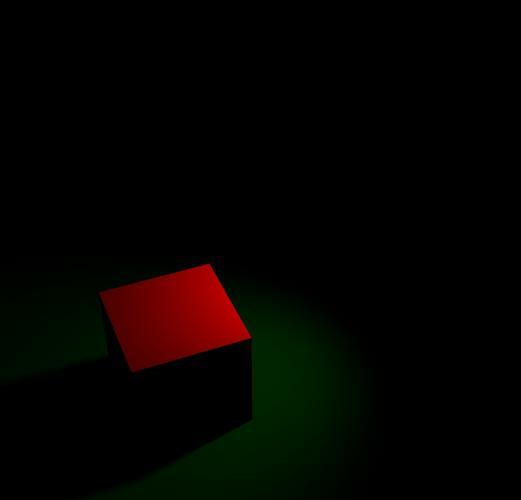 This is a 1-meter red cube sitting on a green plane, with a dzSpotLight set about 350 units above and to the right, with Decay set to 2 and with Intensity set to 1M % (ONE MILLION PERCENT!!!). Pretty friggin' dim. I'm thinkin' the decay model on these lights is broken. Sorry, the start/end stuff was in relation to the uber lights - the Shader Mixer lights don't have that (which is a pain as it's a good way to stop the system wasting time calculating shadows once the light is going to be invisible anyway). Yes, you do need to set the Intensity high with the DS falloff lights - though I'm surprised it's that bad with 1. Note that, as far as I know, the decay is always an integer - I've certainly had little sign of success plugging a fraction into the uber lights. Supposedly, you CAN use non-integer values for decay, but that's software-dependent and not universally supported. I'm just amazed that a one-megawatt spotlight (assuming DAZ light units are measured in watts) barely illuminates a scene with a real-life decay setting of 2. Even with their enhanced features, these lights are looking less and less useful to me, now that I see how they actually perform. Same setup, except this time the light's Intensity has been set to 10M% (ten million percent), with a Decay of 2. Is there even such a thing as a 10 mega-watt lamp? And as far as it goes, these aren't DAZ creations...they are just translations of standard RSL lights. So, the 'features' and controls are RSL. Which means, 'not real world equivalent'. It's just a scale that pretty much is how much on/off the light is compared to a lower/higher value on the slider. What is your gamma setting, in Render Settings>Advanced? Gamma is set to 1 by default, and I've never changed it. So you need to quit thinking that 10,000,000 is actually 'ridiculous'...because that figure has no 'wattage' or any other unit attached to it. And when you look at it, 350 'units' above the object could be very significant, if the fall off is /cm. So that if 350 units is in cm, and every cm the light level drops by 1/4...by 350, you've got next to nothing left (1400x less)...even if it's meters, 3 and half meters is going to be something like 14 times less...Daz Studio 4 units are set in Centimeters. 1 unit =1cm. That would probably explain the huge drop-off. Sorry, but what exactly do you mean by "RSL lights"? Googling the term brings up "Roberts Step-Lite System is a unique lighting system designed to provide an aesthetic solution to the problem of lighting interior and exterior steps, handrails and cove moulding for commercial, as well as residential applications " as well as "In a remote-source lighting (RSL) system, light from a single source is carried over a distance to one or more light outlets, or is emitted evenly along the way". Which were you referring to? These are both real-world light applications, and any real-world light application will be measured in terms of lumens or candlepower or wattage, and a faithful model of that ought to show it (and I'd say someone has made some attempt to make these script lights somewhat faithful). To say that the value is essentially meaningless in a real-world context is a little difficult for me to grasp. It's just very odd that the light from a dzSpotLight at its default setting of 100% Intensity with a real-world decay of 2 will attenuate pretty much completely before it even leaves its source. Maybe I should add that I'm not doubting you -- it just strikes me as odd that someone would go to the trouble of creating a light model that incorporates such real-world features as decay, and then totally ignore the fact that the light emitted by such a source should be referenced or measured in terms of real-world units like lumens, candlepower, or wattage. I hope that makes some kind of sense. It would make a lot of sense -- to ME, at least -- for someone to create a light model and say "with a real-world decay of two, let's set the default Intensity at 100 watts", which means that someone could create an instance of such a light and know that it will illuminate a fairly good-sized room by itself. I also found this: "RSL - Directional Light Source Shaders" (http://www.fundza.com/rman_shaders/lights/directional/index.html) -- which appears to be a discussion of light models/shaders in Maya and RenderMan. And isn't 3Delight derived from or related to RenderMan? It's a pretty technical read, and just skimming through it, I'm not seeing anything directly relevant to this discussion. In another test, I set the dzSpotLight's intensity back to 100% and its Decay to 2, and parked it about 5 units (5 cm.) directly above the cube, at which point, it rendered out to a small circle of light perhaps 5 cm. in diameter -- which means that with a real-world Decay of 2 and with its default Intensity setting of 100%, this light is about as powerful as a small pocket flash-light with a dead battery.